I often mention my mother when I write and the influence she has had on my healthy lifestyle. My dad also played a major role with his athletic and physical activities and healthy eating. Dad raced track in school, played golf regularly in his single years, and performed calisthenics in his later years. His one favorite fitness activity that he did for as long as I can remember is that he walked every day and usually twice. Dad walked no matter what the weather conditions was like – rain, winds and even snow. He would wake up at dawn and out the door he went, walking to Lou’s Sandwich Shop a few miles away to have breakfast with his longtime friends. Afterward, he would walk home to work remotely from his home office for the day and repeat this same walk again to have lunch at the same eatery. Dad also learned to master reading and listening to a talk radio while he walked; as if he body was placed on automatic cruise control! 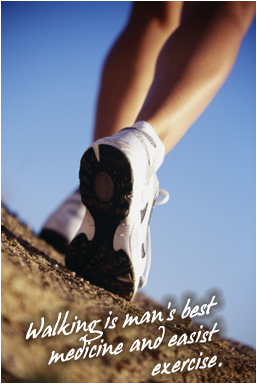 Greek physician Hippocrates once said, “Walking is man’s best medicine.” He’s right! For starters, it is simply one of the easiest, cheapest, and safest activities for burning calories and tuning up the cardiovascular system. Dad walked for years. We lived in the suburbs, he had a car, but he still made it a point to walk. It made his heart strong, his leg muscles solid, and his mood happier. Walkers also have less incidence of cancer, heart disease, stroke, diabetes and other killer diseases. They live longer and get mental health and spiritual benefits. Studies also show that regular walking increases bone density, helps to fade fibromyalgia pain, offsets stress, lessens the need for medications, and provides the time to refocus and reflect in addition to the increased fitness levels and a way to whittle down the weight. There’s also the bonus of soaking up some vitamin D from the sun when walking outside on sunny days. So if you want to get healthier or trim down a little bit, than walking is a good exercise of choice with no gym membership required! If you are not a walker but want to begin, start the first week by walking 20 minutes three times a week. For the next few weeks, increase your time to 30 minutes. As you feel more energetic and fit, add an extra session or two to your weekly walking program. Try to work up to five sessions a week, for 30 to 45 minutes each time, especially if you are trying to pare off fat pounds. Remember to walk at a good pace, too. Here are some additional tips. Wear good sneakers or walking shoes with great support. Let your heel strike the ground first, then roll from the heel to the ball of your foot. Push off with the ball of your foot for more momentum. Maintain your elbows bent at about a 90-degree angle and keep them close to your sides. Swing your arms back and forth as you walk. Keep your head level as you walk and look straight ahead. Take long, smooth strides. Walk as briskly as you can. Breathe deeply but naturally as you walk. What’s especially great about walking is you can do it almost at any time and at any place. You can go solo or take your dog, friends, co-works or children with you for a team effort. Walk on a treadmill at the gym while catching up on your reading, listening to your favorite show, or watching a show on the gym TV. Don’t have time today? Then take the stairs instead of the elevator. Park further from store entrances. And purchase a pedometer to keep track of your steps. You might be delightfully surprised. Walking is fun. It’s great and safe for all ages, from the very young to the very old. Best of all, it’s free. So put on a comfortable pair of walking shoes, grab some chilled water, and get out there for a healthy walk and healthier life.